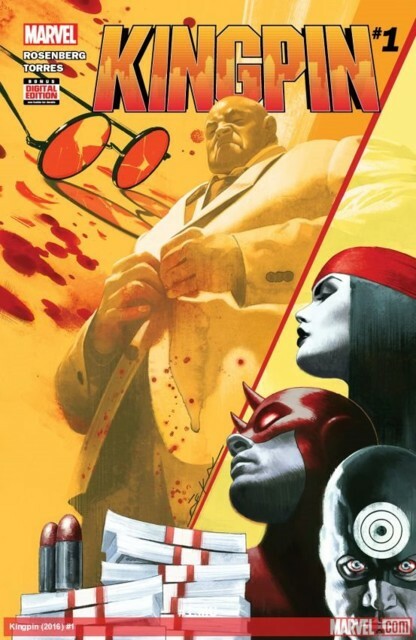 Coming in February: KINGPIN #1, by writer Matthew Rosenberg and artist Ben Torres, with a cover by Jeff Dekal. Marvel has an interview with Rosenberg and editor Mark Paniccia, where they talk about Wilson Fisk's return to NYC. Well our focus is on telling stories about Fisk and how he sees the world. He is a very driven and determined man, but he is a businessman. All of his work is about setting ambitious goals and then figuring out ways to overcome the huge obstacles that come with that. So whether it’s labor laws, zoning regulations, tax codes, the crime prediction powers of Ulysses, or Daredevil’s relentless harassment, they are all just problems to deal with.